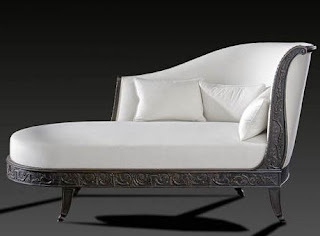 Dimensions : H: 8 1/4 in. x W: 9 7/8 in. x D: 2 in. Because the recessed top of this antique reproduction table is removable, the table may also have been used as a stand for a cabinet. 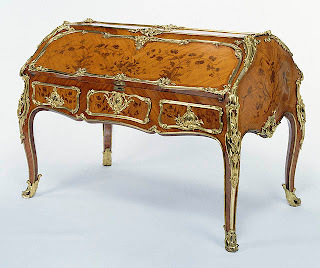 With naturalistic flowers and birds, the table's wood marquetry is of extremely high quality and was probably made by the royal cabinetmaker André-Charles Boulle. 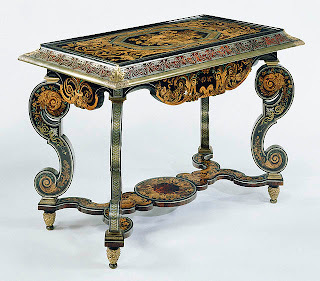 The Antique table's design and the combination of marquetry made of wood and marquetry in tortoiseshell, pewter, brass, and ebony point to Boulle's particular specialties. 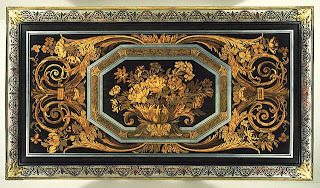 The design of the table's border is the same as that on two jewel coffers made by Boulle.